By Majed Iqbal- The Pakistan British Council has released a report titled “Pakistan: The Next Generation”, a large section of which aims at encapsulating the opinions of the youth of Pakistan on a variety of matters like religion, education and international politics. The report set out to argue for the ‘demographic dividend’, a principle which suggests that Pakistan is in a distinct situation where the talents of a whole generation of youth can be used for the prosperity of the country in the next 35 years- a far removed picture of the turmoil in Politics the country has witnessed over the last decade and the events post 9/11. In its findings the report highlights many key concerns of Pakistani Youth and is described as being perhaps the” first truly representative survey and report of its kind in the country”. Looking into the identity dilemma for the youth of Pakistan after 9/11 and Pakistan’s frontline role in America’s War on Terror, the report highlights a strong relationship of the youth with the country but with very little trust in national or local government, the police and even courts, in spite of the reinstatement of the celebrated senior judiciary that was dismissed by the Musharraf dictatorship in November 2007. 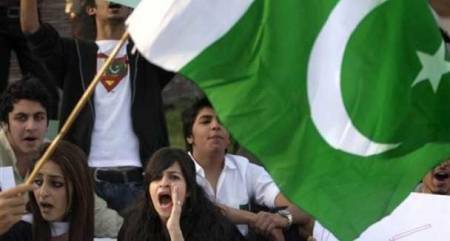 It highlights that merely 15 per cent of the Pakistani youth believe that the country is headed in the right direction. There were signs of growing signs of disillusionment with democracy within the youth with only a third of those surveyed believed that democracy is the best system for the country- this is despite living under a ‘revived’ Democracy in the last two years. Years of Musharraf rule promised much; Change, progress, development, fighting corruption. But he was seen to only be worried about securing his own seat and endorsing foreign plans. “We supported Musharraf because of his promises to fight extremism, bring accountability into politics, open up an independent media and reduce the immoral gap between Pakistan’s rich and poor. But no amount of governmental fear-mongering can make us look the other way while he imposes emergency rule, intimidates the media, dismantles the judiciary and muzzles dissent”. For many of the youth it was argued and promised that a Democracy would be the only way to salvage Pakistan from power hungry individuals and foreign influence. However, today, the youth witness a Democracy which makes an un-elected individual the President of the country, a democracy which opens Islamabad further to monthly visits from the American Administration, a democracy which gives the green light in Parliament for Drone attacks launched from Pakistani soil to be fired into Afghanistan, a Democracy which continues to allow a Pakistani Citizen, Dr Afia Siddiqui to be held on false charges in the US, a Democracy which allows the head of State to replace unfavourable judges to the establishment and it is a Democracy which is encouraging corruption, economic decline and civil war in its own country thorough the support for American security firms like Blackwater, accused of masterminding many of the explosions in the country which were blamed on militant elements. So many youth are rightly posing the question “What is the Difference between Democracy and Dictatorship” when both deliver the same results? The report brings further twists stating that about three-quarters of the Pakistani youth define themselves as being Muslims first and then Pakistani. Fourteen per cent see themselves as Pakistani citizens first. A surprising outcome for many after Musharraf’s efforts in his tenure with his “Pakistan First” policy, alienating many in the process like Afghanistan and Kashmir whom the people of Pakistan had decades of relationship with through regional links and their Islamic faith. It also highlights that Pakistani Youth are in tune with international events, have a sense of Islamic Identity through the Islamic concept of Ummah (global Muslim community/nation), and do not necessarily buy into what leading powers are planning for their country under the guise of fighting the War on Terror. Exposure to the internet and international Television Stations covering News and events has allowed many young people to explore in more detail what is happening around them; above and beyond from the state controlled media and narrative on events. When questioned about the reasons behind the recent spat of terrorist and other violence in the country, the respondents point the finger at ‘injustice’ (30 per cent); and ‘economics conditions’ (28 per cent). In matters of education, not surprisingly, a healthy 92 per cent of the youth believe in the importance of educational development and access to learning opportunities. The report in which around 2,500 young men and women (writers, journalists, students, NGO workers) were involved in the writing and preparation of has provided a snapshot of the feelings, views and visions of how the youth in Pakistan see their country as it stands. The report highlights clearly the role and importance of religion in the debate centring identity despite concentrated efforts to limit this to the national borders of the country. It has further detailed the disillusionment of the systems which have governed Pakistan over the years taking the forms of Dictatorships, Martial law impositions and Democracy as it stands today under the Zardari regime. One thing is for sure is that the future of any nation can be changed by the energies and talents of young people when the status quo is challenged. « Are Pakistani Rock Stars ‘Radicalising’ the nation? The fact that the muslims identifying themselves on the basis of religion first, has nothing to do with 9/11. This is the culture of the muslims for many many generations. This is dangerous, and leads to an inherent tendency of intolerence towards faiths. Pakistan is an worst example of this, where hate towards other faiths has been taught to atleast two generations, systematically through school text books. You are right- Muslim Identity as a first is based on Islamic ideals which did not come about post 9/11. How you have concluded that this is dangerous is mind-boggling. A brief level of research of Islam will highlight to you how it promotes the gelling of people of all faiths and cultures. Islam has citizenship laws which are enshrined in a state which is based on Islam- unlike the modern era where muslim countries either have dictatorships or Democracy where power rests with a few people and families. History bears testimony to the protection, respect and tolerance Muslims delivered under Islamic Rule. soemthing which Historians still marvel at. “Islam had brought to India a luminous torch which rescued humanity from darkness at a time when old civilizations were on the decline and lofty moral ideals had got reduced to empty intellectual concepts. As in other lands, so in India too, the conquests of Islam were more widespread in the world of thought than in the world of politics”. We have been groomed in a world where we are unable to look out beyond the box of seculal thought which narrows religious ideals to customs and rituals on a personal level. Islam is unique in that it offers a total package from Politics to Economics and from citizenship to education. I invite you to study further aspects of Islam and please feel free to continue to raise critical discourse on this topic. What you have quoted, are from the history. Look at the Islam of today. There are different interpretations of Islam going around. The barbaric version of it is display on broad daylight in Taliban controlled areas of Pakistan & Afghanistan, Saudi Arabia, Sudan, Somalia and some other places. The good version is also practiced by a lot of muslims, but they seem to be minorities. Good Islam has been hijacked by barbaric Islam. You muslims need to stand-up and fight those that parctice barbaric Islam. Islam is not based on History- Islam makes history with its unique offerings as a model for societal order with peace, stability and progress at the centre of its civilasational values for the peoples and nations it has touched. Once again, i invite you to study Islam in more detail such that you are able to see how Islam can solve basic problems for muslim countries which are still under colonial influence and whose rulers and governments (kingships, Dictatoships) are endorsed by leading powers. – reality is quite the opposite and I am seeing enough of it all over the world. Your comments seem quite contradictory. In your previous comment you were praising Islamic History which was based on the un-deniable quotes i presented from famous figures. You said “What you have quoted, are from the history ” acknowledging that the same Islamic System is not present here today.